Smalltooth cookiecutter shark Isistius brasiliensis, photographed by Joshua Lambus. The article itself is in a journal I don't have access to, but I can read the abstract: the person attacked was a long-distance swimmer in Hawaii and was bitten twice. The bite was treated with skin grafts, but still took nine months to finish healing. 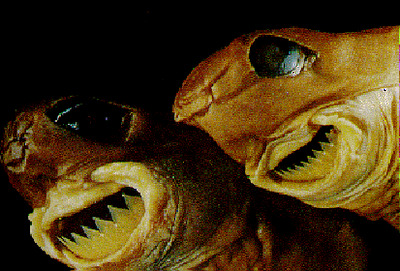 Cookiecutter sharks are one of the more fascinatingly evil fish out there. They are small, as sharks go (up to about 50 cm, tops) but have proportionately oversized teeth that are arranged in a tight, single-row array that can be protruded outwards to take a neat plug out of the flesh of a larger animal: hence the name of 'cookiecutter'. The effectiveness of the cutting tooth row is maintained by being replaced all at once, rather than individual teeth being replaced piecemeal as in other sharks. Cookiecutters are rarely encountered by humans as they are generally deep sea fish, living below the light zone, but like many mesopelagic animals they appear to migrate closer to the surface at night (Papastamatiou et al. 2010). Bioluminescent photophores behind the head have been suggested to function as a lure, drawing larger fish, dolphins, etc. into range of an ambush. Cookiecutters have very catholic tastes, and evidence of bites has been recorded from just about any decent-sized pelagic animal. They will even bite the external insulation on submarines. Fish with cookiecutter bites, from Rick Macpherson (who, it turns out, covered this event when it was first happened). Given their lack of pickiness, it is hardly surprising that a cookiecutter would take a bite out of a human. 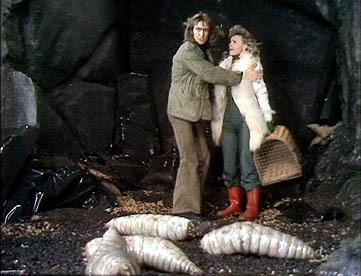 Of course, humans very rarely venture into the pelagic environment in which cookiecutters can be found. The very fact that the Hawaii indicent is the first confirmed attack indicates how extremely rare this would be expected to be. The Wikipedia page on cookiecutters refers to possible attacks on shipwreck survivors (though the source page linked to does not provide citations for such reports), and the body of a drowned fisherman was recovered in Hawaii with cookiecutter bites. But unless you happen to be swimming in the open ocean at night, your chances of being bitten by a cookiecutter are low. Papastamatiou, Y. P., B. M. Wetherbee, J. O’Sullivan, G. D. Goodmanlowe & C. G. Lowe. 2010. 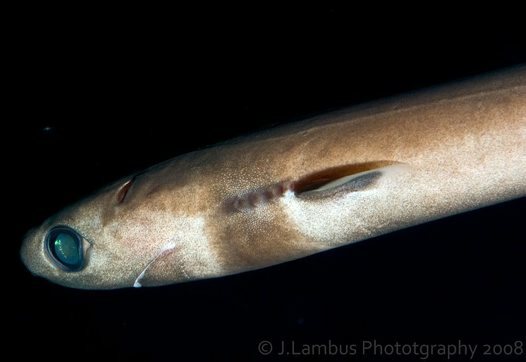 Foraging ecology of cookiecutter sharks (Isistius brasiliensis) on pelagic fishes in Hawaii, inferred from prey bite wounds. Environmental Biology of Fishes 88 (4): 361-368. I have the article, if you want it - do you have an email address? It's in the header at the top right of the page: gerarus at westnet.com.au. I find it remarkable that Isistius has been able to evolve such an apparently high-risk foraging strategy in the first place. Cookiecutter sharks frequently feed on the flesh of much larger predatory animals such as other sharks, dolphins, and pinnipeds; animals that, once bitten, one would expect to be quite capable of quick and fatal retaliation. It's really quite astonishing that these small sharks can do what they do and get away with it. But then, cookiecutters only ever attack in the dark, and they presumably don't generally hang around for a second bite. By the time the attacked predator gets over the initial shock, the cookiecutter is gone, and the victim can't tell where. I'm not aware if a cookiecutter has ever actually been observed in the process of attacking something, except possibly by the victims of the unconfirmed attacks on humans mentioned in the post, who were not really in a position to be thinking of taking notes. It would be interesting to know if cookiecutters engaged in any behaviours to avoid detection by victims after attacks, such as hiding the bioluminescent organs. 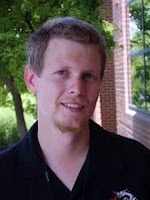 "the victim can't tell where"
"It would be interesting to know if cookiecutters engaged in any behaviours to avoid detection by victims after attacks"
Widder (1998:271) speculates (somewhat fancifully, IMO) that they may find safety in numbers. She writes: "Schooling may also explain how these very small sharks avoid a counterattack from the very large predators such as swordfish and porpoises on which their crater wounds are commonly found. The damage these sharks inflict would make their company as appealing as a swarm of wasps." Widder, E.A. 1998. A predatory use of counterillumination by the squaloid shark, Isistius brasiliensis. Environmental Biology of Fishes 53, 267-273. Admittedly I'm assuming here that many/most attacks on dolphins and other odontocetes by Isistius take place in open water where hiding places aren't available. That seems a safe assumption to make. To the best of my (limited) knowledge, Isistius is only ever found in pelagic habitats. Even without taking schooling into the equation, startled victims may be more inclined to just get the fin out of there rather than trying to find what just attacked them. I'd expect these sharks target drowsy prey such as dolphins swimming during unihemispheric sleep. This article on fast-healing dolphins might indicate natural selection for immediate healing rather than revengeful counter-attacks? 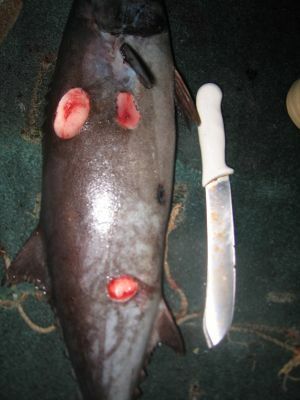 DDeden: "natural selection for immediate healing"
Cookiecutter shark bite wounds may heal quickly, but apparently not completely (judging by pictures in, e.g., Papastamatiou et al., 2010). The bites seem to leave noticeable and fairly sizeable scars on the victims' bodies. To have lots of such scars (and we do know for a a fact that many prey animal individuals get bitten repeatedly in their lifetimes) presumably has some negative effect on overall fitness. Blood & tissue loss and the risk of infections aside, having multiple scars (in various stages of healing) on the body's surface must surely affect the prey animal's hydrodynamics. And that is presumably of non-trivial importance to such specialised fast-swimmers as billfish, tunas, and dolphins. In other words: In the cookiecutter shark's prey species, I'd expect natural selection to favour such defence strategies that prevent the prey from getting bitten at all rather than 'damage control' strategies. In this light, the victims' apparent vulnerability seems puzzling to me. But at this stage in this particular evolutionary arms race, perhaps Isistius is just one step ahead of its prey? The idea of cookiecutters targeting drowsy prey doesn't strike me as inherently unlikely, though if the bioluminescent organs do indeed act as a lure then its targets must be at least sometimes fully active. Fascinating and fantastically gruesome. And they're cute little critters, too.